Damage from falling trees and flying branches, severe rainfall and flooding are among some of the serious risks for property owners during a hurricane. According to the 2018 Corelogic Storm Surge Report, 9 million homes are at risk for hurricane storm surge damage alone. Hurricanes are massive storms that form over water and make their way into land in coastal regions. Hurricane season runs from June 1 to November 30th in the Atlantic and May 15th to November 30th in the Eastern Atlantic. During this time, many coastal home and property owners worry about damage from hurricanes and what may or may not be covered by their insurance. Getting paid for damage after a hurricane requires you get the right insurance beforehand. In this article, we will cover the frequently asked questions about hurricane damage and property damage as well as differences between home insurance coverage and the flood and windstorm coverage needed. Throughout, we have links to additional information on topics if you want further details. If you have hurricane damage and are trying to figure out how to make a claim and what might be covered, this article can be used as a resource along the way. You may not need all the information here today, but you may want to reference back as you buy insurance or deal with your claim, since major disaster claims usually take some time to resolve and many questions can come up in the process. You can learn more about what to expect in a major claim here. Will a Homeowner Policy Cover Hurricane Damage? the type of homeowner coverage you purchased and where you live. Homes and properties like condos in high-risk zones have different coverages available to them than areas which are considered lower risk. 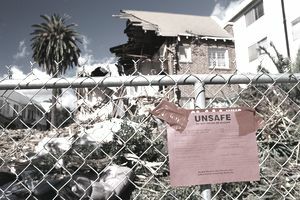 Depending on where you live, your home, renter or condo policy may cover some of your property from damages resulting from hurricane-force wind damage, however, areas that are prone to hurricanes (and also tornadoes) may have exclusions for this type of wind damage, or may require you to add an endorsement for windstorm coverage. In addition to variations in coverage based on the state or area you live in, the other complicated thing about hurricanes is that they cause different kinds of damage, so not all damage is covered under your homeowner policy alone and the answers to what is covered can be complex. Although sewer backup may also occur, the cause of the sewer backup is important to know. It may be covered if the source of the backup is heavy rainfall and you have purchased a sewer backup endorsement. The coverage is based on the wording and exclusions of your policy, as well as how the event is defined by your insurance company. If it is a result of a flood, sewer backup may not pay. For example: If the sewer backup is caused by a flood, and you did not have flood insurance, then you may not be covered. You can get Sewer Back-Up coverage as an endorsement on your homeowner policy by asking your insurance broker or agent about adding it. Sewer Back-Up could happen without a flood, and in this case, it may be covered if you had the endorsement. What Kinds of Damage Will a Hurricane Cause? will be subject to a deductible. The deductible will vary based on what coverage applies to the claimed damage. (We discuss hurricane deductibles in more detail below). Although you might be covered by a standard homeowner policy for windstorms, in hurricane-prone areas you may not be. It is really important to ask your agent or broker about how your policy covers you and what the limits, deductibles, and exclusions are. A policy that covers hurricane wind damage or an endorsement covering this may also have a different deductible than your basic policy. According to the Insurance Information Institute (III), the following states are among those that may charge a special deductible for windstorm: Alabama, Connecticut, Delaware, Florida, Georgia, Hawaii, Louisiana, Maine, Maryland, Massachusetts, Mississippi, New Jersey, New York, North Carolina, Pennsylvania, Rhode Island, South Carolina, Texas and Virginia. Each state has different criteria, coverage options, exclusions and availability of coverage. If you need extra coverage to handle the wind damage that may occur from a hurricane, be sure and find out how to get it from your representative. When you buy a windstorm policy, you may also face a 15 day waiting period. Be sure and ask when the coverage takes effect after you buy a policy. Alabama,Connecticut, Delaware, Florida, Georgia, Louisiana, Maryland, Massachusetts, Mississippi, New Jersey, New York, Rhode Island, South Carolina, Texas, Virginia. If your own insurance company does not provide it, shop around and see if another insurance company in your area would provide the coverage. This might save you money. You may also be able to purchase an additional windstorm policy in some states (see the examples above). If you aren't sure, you can contact your state insurance commissioner's office and they will be able to help you figure out your options. If your community participates in the National Flood Insurance Program (NFIP), then you can purchase flood insurance through the NFIP. You can ask your home insurance representative for information or check the list of participating NFIP communities. Flood insurance may also be available through private insurance companies. Although a standard homeowner policy covers some forms of water damage, a standard homeowner policy does not cover flood, you must purchase the coverage specifically. Learn more about different kinds of water damage. Can You Buy Hurricane, Windstorm or Flood Coverage Right Before a Hurricane? The insurance companies may temporarily stop selling hurricane-related damage insurance before a hurricane watch. This will depend on the insurance company, but once you are about 48 hours before a hurricane watch, it may not be possible to buy coverage. Even if you buy the coverage right before a storm, these storm policies usually have waiting periods. For example, you can buy flood insurance, however, there is a usually a waiting period of 30 days before your coverage takes effect, so if you wait until a hurricane or flood is about to happen to try and buy coverage, you will be out of luck for any impending damages. This site also gives estimates on costs of flood insurance in different areas, with interesting tips and facts, like 25 percent of homes with flood claims each year are in low-risk zones. When your home is made uninhabitable after a hurricane, you may have to find somewhere else to live while your home is being rebuilt or repaired. The costs of living somewhere else may be covered by your insurance, so be sure and keep all receipts and documents related to your costs in case you are able to get reimbursement for your actual loss. Homeowner policies usually include coverage for Additional Living Expenses (ALE) after a covered loss. The key here is that in order for the additional living expenses to be paid for, the cause of the claim and the cause of damage that has made your home uninhabitable must be covered and not excluded on your standard homeowner policy. If you are displaced due to a flood, for example, and have coverage through the NFIP, then even though you have coverage for the flood, you would not be covered for additional living expenses. However, according to the III, Excess Flood Insurance through private insurers for homes valued over $250,000 or in communities not served by the NFIP do provide coverage for additional living expenses. Excess Flood insurance is available through private insurers and may be available to you through your home insurance representative or company. Ask your insurance agent or broker about the coverage options. How Much Will Insurance Pay? The maximum amounts payable in an insurance claim are dictated by the limits and deductibles listed on your insurance policy declaration page or coverage summary. Your claim settlement will also take into account the additional exclusions or special limits of insurance listed in the policy wording. For example, if you need to rebuild your home after a major disaster, you will need to have the right amount of insurance on the dwelling in order to get your replacement cost value. Depending on what coverage caused the loss, you may have different deductibles to consider. You should also become familiar with the special limits of insurance on your policy. We explain more about special limits of insurance here. Special limits and even exclusions may apply to landscaping and contents of your home, as well as to smaller items usually included in your home insurance policy like canoes, sports equipment, bicycles, small boats or even golf carts. Finally, another factor in how much you will get paid in a claim is the kind of coverage you have. When you purchase your personal property or home insurance, you can have replacement cost as a basis of claims settlement, or actual cash value. Some companies even offer guaranteed replacement cost or cash out options. Each policy has different conditions, for example, in the case of flood insurance, you may have replacement cost value on your home. This means that the insurance will pay the cost to rebuild the home, however, in the NFIP, the coverage on your contents may only be actual cash value (ACV). ACV means that you will only be compensated for the depreciated value of your property. You will not receive enough money to replace the items you lost. Because Hurricanes cause such a wide range of damage, and also because there are different types of policies which may or may not pay for damages caused by hurricanes and hurricane-related events, your best bet is to use the information here as a guideline to reach out to your insurer and ask the necessary questions to be sure that you are covered and get the coverage you will need in your circumstance.